It’s gray whale season. As you gaze out across the Pacific, you may see one. These whales are gray in color (hence their name), and are dotted with white markings—scars from parasitic barnacles that attached themselves to the whales’ skin, and then fell off. As they dive, you won’t see a dorsal fin—gray whales don’t have them—but you might see a series of bumps that extend from the middle of the back towards the tail. The gray whales we see this time of year are traveling from the Bering and Chukghi seas, their summer feeding grounds, to Baja, where they mate and give birth to their calves. These are some big babies—they’re about 4.5 meters (15 feet) long and weigh up to 1,500 pounds! Historically, gray whales had a wide distribution. There were four populations: the Eastern North Pacific population that we see migrating along our coast, a Western North Pacific population along the coast of Asia, and two populations in the North Atlantic. The Eastern North Atlantic population, along the coast of Europe, went extinct in the 5th century. The Western North Atlantic population, along the east coast of North America, went extinct in the 18th century because of whaling. Today, the North Pacific population close to Asia is critically endangered, with fewer than 200 individuals. The North Pacific population along our coast is doing well, with over 20,000 individuals. This past summer, a gray whale was spotted in the Mediterranean—first near Israel, and then near Spain. The Mediterranean may have been a breeding ground for grey whales, before whales in this region died out. It is thought that this lone whale crossed from the Pacific to the Atlantic via the Northwest Passage. For centuries, the Northwest Passage has been, well, impassable, clogged with sea ice and impossible to navigate. But because of global warming, the sea ice is melting. In the summertime, it is possible for ships to move through the Northwest Passage, opening a new trade route through the Arctic. The opening of the Northwest Passage to trade is controversial; countries debate over who controls this new waterway, and the presence of container ships, with their loud noises and polluting fuels, could adversely affect Arctic wildlife. Ships can do major physical damage to whales, as QUEST blogger David McGuire pointed out in this blog post. And engine noise travels far underwater, which can interfere with whale communication. Sonar’s effects on marine mammals can be even worse. 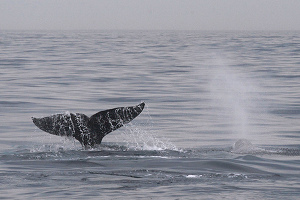 For more on gray whales, check out this Jean-Michel Cousteau Ocean Adventures video. And find out where you can see gray whales yourself, with this list of gray whale resources from Bay Nature.